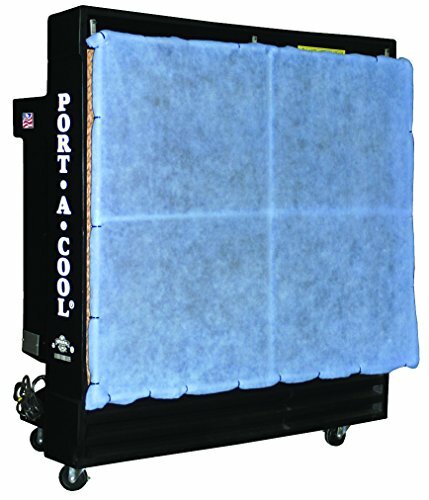 The Portacool PAC-FRAME-36 Filter and Frame Package for 36-Inch Portacool Portable Evaporative Cooling Units helps to keep airborne contaminants from clogging the Kuul pads cooling media. This filter system catches most foreign particles before they reach the cooling pads. It prevents air flow restriction and possible damage to the unit from heavily contaminated filters prior to replacement. Using a filtration system will extend the life of your evaporative cooling media by protecting it from debris. This filter provides maximum protection against the elements with USA filtration of 3.3-microns per square yard. It's compatible with all 36-inch Portacool units old and new, including item numbers 250784, 250786 and 250796. For over 20 years, Portacool, LLC has been the industry leader in the design and manufacturing of portable evaporative cooling units and evaporative cooling media. We specialize in evaporative cooling: HVAC and agriculture products, industrial and commercial products along with personal and residential products. If you have any questions about this product by Portacool, contact us by completing and submitting the form below. If you are looking for a specif part number, please include it with your message.